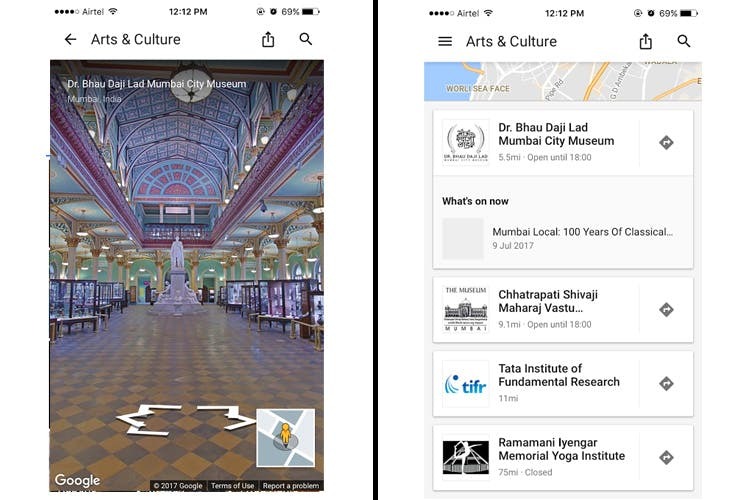 Arts & Culture is the latest app by Google that lets you visit art galleries and museums around the world, including the ones in Mumbai, virtually. Arts & Culture by Google is easily available on android and iOS phones, free of cost. Once you download it, it’ll ask for your location and customise the settings. If you’re an art lover, then this app is perfect for you. It lists artists, artwork, virtual museums and art galleries across the world, and even lets you read up about art history and art movements. The app is extremely user friendly and lets us browse freely. It has sections that one can click and read up about. The most fascinating thing however, is that you can visit any museum or art gallery in the world, be it in Paris, Rome or Brooklyn and get a virtual tour of it. A 360-degree tour that lets you move around and walk through the space. Not just this, the app is a huge repository of artworks in different mediums. Additionally, the home page has some brilliant feature articles one can read on arts and culture. From early women designers to the architect that finished the Sydney Opera House – it lets you explore everything. Large murals painted in India are also a part of it. If you’re somewhat of an art buff and don’t know where to get a head start with your art readings, and have museums you’d like to tick off of your list, then download the app and let the artworks amaze you.